Luis Suarez could not hep but gloat and admitted his two goals that leave England on the brink of World Cup elimination were sweet revenge for all the criticism he has got playing in the Premier League. The Liverpool goal poacher has been banned in recent times, for racially abusing Manchester United’s Patrice Evra and for biting Chelsea’s Branislav Ivanovic amongst other offenses. His two goals were the right answers to all the criticisms he gets while paying in the English premier league. Having undergone a knee operation last month, there had been concerns over the 27-year-old's participation in the world cup. The talk continued after coach Oscar Taberez did not deem him fit enough to feature in the embarrassing defeat to Costa Rica on Saturday. Suarez, however, returned against England and how, netting either side of Wayne Rooney's first World Cup goal to help Uruguay to a vital 2-1 win in Sao Paulo. Defeat would have left them facing the prospect of World Cup elimination, but the result at the Arena Corinthians means it is England teetering over the precipice. 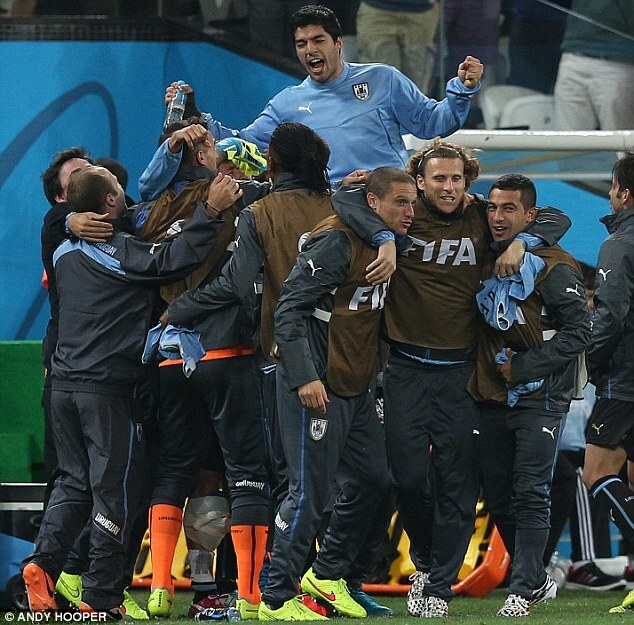 Suarez was held aloft by his teammates at the final whistle, admitting afterward this was a moment he had dreamt of. ‘I dreamt this. I’m enjoying this moment, because of all I suffered, the criticism I received. So, there you go.' Suarez taunted. "It was one of the best games I've played," he said. "It's an amazing moment for me. Maybe a few days ago I thought this wouldn't be possible. "Before the game too many people in England laughed about my attitude over the last few years. This is a very good time for me. I want to see what they think now." Even with the celebration, Suarez still felt sorry for his captain and teammate in Liverpool, Steven Gerrard. 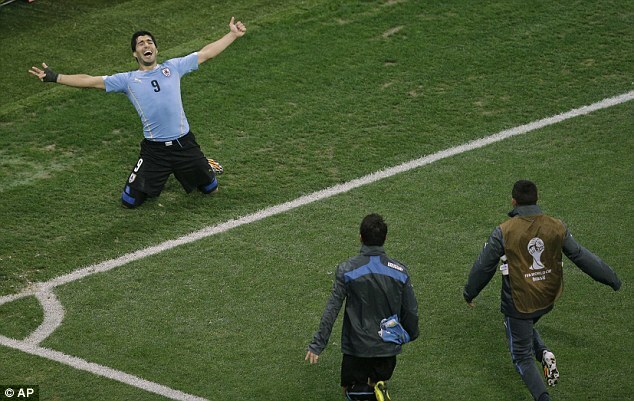 An error from Steven Gerrard allowed Suarez in to score Uruguay's decisive second goal with six minutes to play. 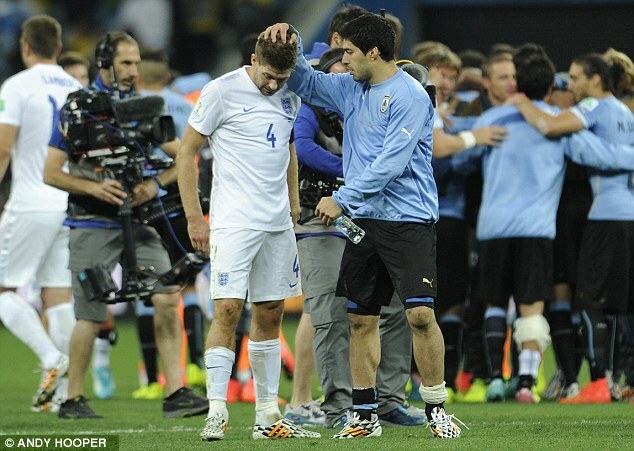 Suarez said he told his Liverpool team-mate to keep his head up after the game. "I told him to keep going," Suarez said. "He's the best player I've played with on the pitch. "This is an unlucky moment for him. I don't like it when he hurts like this. I said 'Keep going, forget this game, you're one of the best.'"